Ok…here is another surreal day that would take hours to accuratly describe but we will try to set the scene the best we can. At 8:30 am we were picked up by a driver from the Elephant Nature Park to head to the local market to help load watermelons (25 kilograms per bag) and tons of bananas filling up the back of a pickup truck..assembly line style!! Now on to the park which took about an hour into the mountains outside of Chiang Mai. 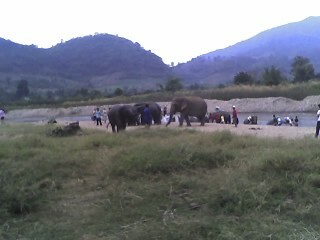 The elephants were in a valley surrounded by the local hill tribes high above!!! Our first order of “business” was to feed the elephants from a deck/platform which brought us very up close and personal with these magnificent creatures. We were told the stories of each of the 31 rescued ellies some which broke your heart absolutely in two!!!!! After a fantastic spread of home cooked Thai food for lunch we were led down to the river with elephants and mahouts in tow to bathe these giant beauties!!!! Little did Diana and I know what an honor was to be granted to us. Because of my eye issues and cane, one of the staff “Jody” took us under her wing and gave us a private walk with 2 very important elephants elepants at the park. Mae Perm and Jokia were the ellie girls we were introduced to on a very personal basis. Jokia was completely blind and Mae Perm is her helper and best friend. Diana and I just looked at one another with tears welling up in our eyes and said “they are just like US”!!! At the time…while we were socializing with our elephant counterparts, we assumed that the other guest were also with grouping off and bonding with an elephant or two like us…and to our surprise when our girls moved off to graze and we turned around…we found all the other guests grouped around the mud wallow watching the elephants doing mud baths. We were the ONLY ones who got to have a one on one experience!!!!!!! We also met a beautiful young male ellie named HOPE who was inspiring and stunning. Just a round elephant all over!!! One of the Karen villages contacted Lek and told her they had a one week old baby whos mother died of disease. She made a long journey into the forest and rescued him and has raised him at the park. He inspired a wonderful t shirt slogan in the gift shop which states “PEACE + LOVE = HOPE”. He was a hoot…a real ambassador for the park giving kisses to everyone. We have smooch marks to prove it! Will update more with tons of pix to come. Check out the other posts at https://graffitigossip.com to catch up on all the blog entries and click on COMMENTS under each post to read comments and add your own. This is impressive. You were in there with the elephants! And you can see grass! Had forgotten what that looks like. Little more snow last night here on top of the ice. Add 30 mph winds and minus 9… Wind chill is 35 below. Lots of schools still not open. Thanks for letting us all live your trip. Can’t wait to see the photo albums when you return. This so funny you guys. We noticed there were 2 comments on this post shortly after we signed on and Diana said…”this must be Claudia and Jim”..Creepy huh…lol! OMG you guys have no freaking idea how cool the Ele park was!! Check post in a bit to see our updates on the elephant pix. You must be freezing your bums off!!!! Oh wow I am sitting here tearing up over what you wrote. What an amazing opportunity you had to share your lives with these amazing creatures. I am so happy to hear that they ave been re-given their lives! What an experience! The elephants were a highlight of our trip also. OHHHHHHHH! Sandy and Diana, words just won’t express the emotions running through me after reading this post. Wow, That is really a experience of a life time. So glad you shared it with us. Have MUCH fun! See you when you get home. Hey everyone!!! What a joy it is to see so many comments and we TOTALLY look forward to each and every one!!! Not much time to answer each of you personally but THANK YOU from the bottom of our hearts for joining us in our journey!!!!! More pix on the way. Yes…I agree Louise…the ellies were at the top of our list of incredible places!!! !